This spectacular and unique island just offshore from Lund is one of Powell River’s pre-eminent tourist destinations. Funky cabins are dotted around the wooded interior of this almost completely sand-based oasis. The yellow beaches, meanwhile, are famous amongst vacation seekers, locals and visitors alike. 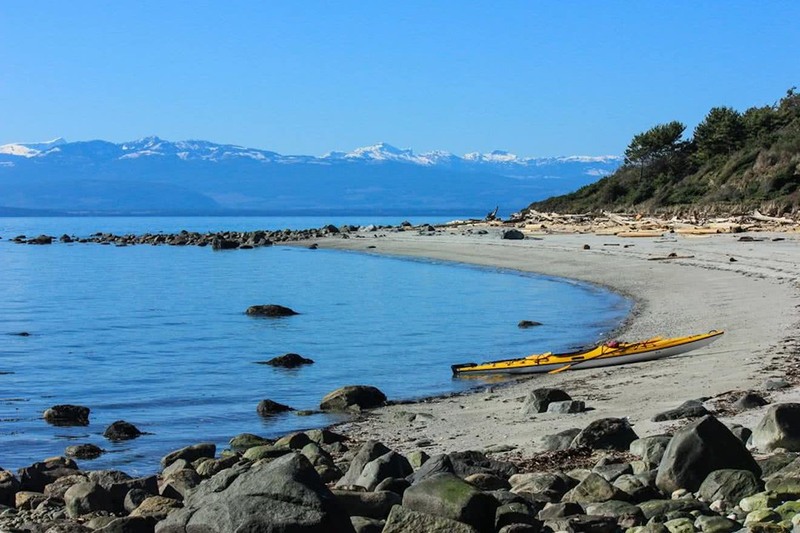 Savary Island is located at the meeting point of two tidal streams, around both tips of Vancouver Island. This means that the water temperatures in this part of the world are much higher than elsewhere. This is especially true when the sun has time to bake the yellow sand on long beaches or in protected coves, and the incoming tide warms up to perfect swimming conditions. It’s tempting for even the most hesitant swimmer to jump into the calm, warm ocean. 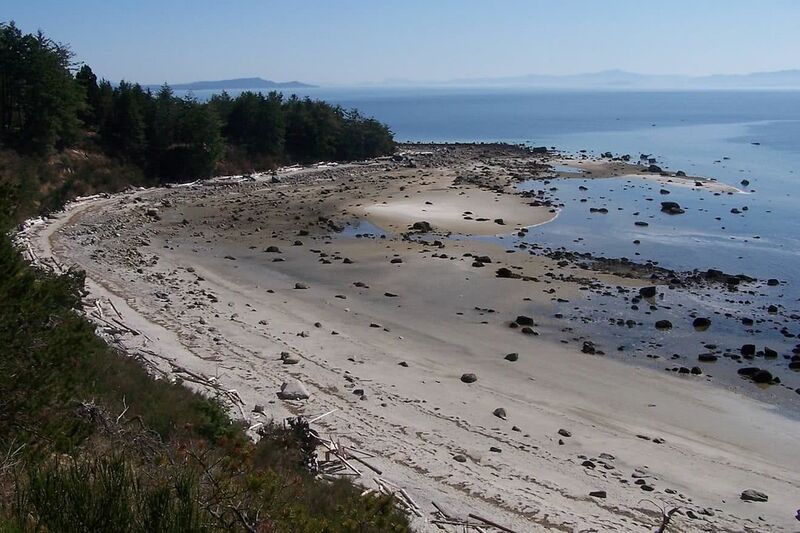 South Beach is the most popular beach destination on Savary. It is easily accessed by crossing the shortest length of the island after hopping off the water taxi from Lund. Huge fields of driftwood line the high tide line of the beach, creatively put to use to build makeshift shelters with which to avoid the summer heat. Skim boarders, kayakers and stand-up paddle boarders drift up and down the coast in the ebbing and flowing tide. On the western edge of Savary, Indian Point is another popular beach. The long expanses of sand stretch further and further from the shore at low tide, towards the distant, snow-capped peaks of Vancouver Island on the horizon. If you’re looking for a bit of isolation on your beach-side vacation however, do not fear! Duck Bay in the centre of the southern shore of Savary, is almost continuously vacant no matter which time of year. You could spend all afternoon on the beach and see no one except for the occasional dogwalker or kayaker. This large bay is protected from the ocean by a long, rocky reef of erratic boulders, remnants of the island’s formation as a glacial moraine. This natural barrier keeps the power boats out and the atmosphere serene. At low tide you can even walk right out to many of the these boulders and search amongst them for all kinds of marine and bird life, from sea stars and cucumbers to beached seals and bald eagles. The shore of Duck Bay is protected from development to protect this sensitive eco-system from overuse and exploitation. An oasis of solitude therefore exists amongst the island’s more populated and popular bays, beaches and coves. Willingdon Beach sits at the northern end of the commercial hub of Marine Drive. 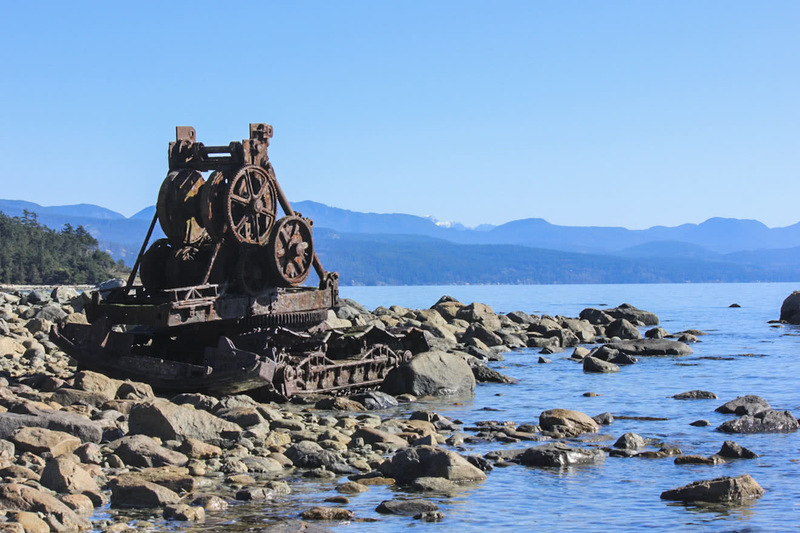 It is incredible popular in the summer months, with easy access to the Willingdon Beach Trail and acting as the focal point for many festivals and events including PRISMA performances, Powell River Logging Sports, Sea Fair, Powell River Pride, and much more. Gibson’s Beach is accessed right off Highway 101, less than 10 minutes north of town. It is away from civilization and with large open areas for the kids to play in the sand or explore the myriad of pools along the shore. 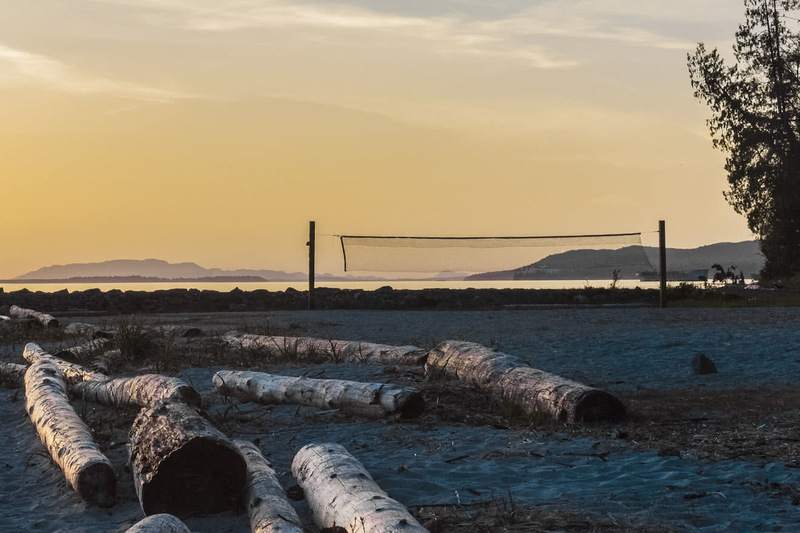 The beach has fantastic views to the north west, and those dazzling summer sunsets over northern Vancouver Island. Access right off the highway also makes it a great launching point for kayaking or canoeing up and down the coast! One of the more popular beaches south of town is Donkersley Beach, found at the end of Donkersley Road south of town. This beach has a south west aspect which offers incredible views straight down the Strait of Georgia, between Texada and Nelson Islands, and a very unique perspective not usually seen from other Powell River coastlines. At low tide the flat sandy beach at Donkersley extends far into the distance. Huge games of frisbee take place along the shore, skimboarders throw down tricks along the smooth wet sand by the water, and kids sit and build massive sandcastles that could stand the test of time. As the tide rises, too, the warm sand heats the incoming water to bath-like temperatures, transporting you far away with just a little imagination to much warmer, southern climates. 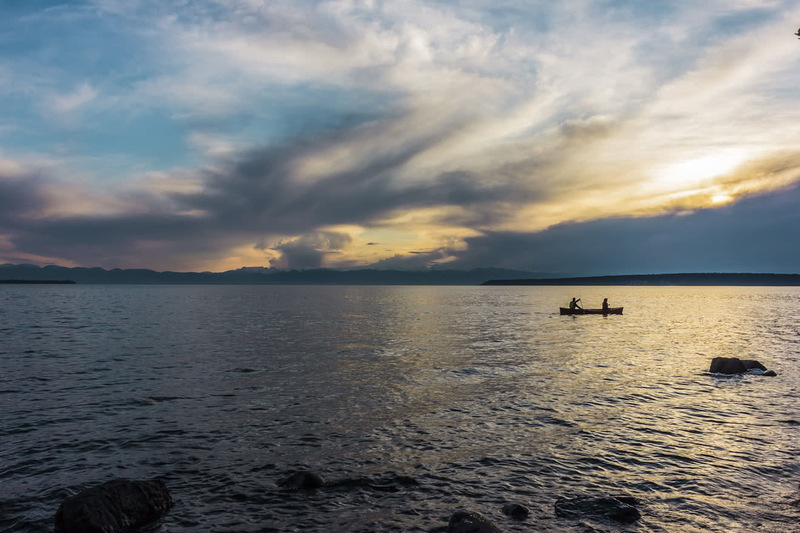 Perhaps the most memorable ocean-side moments, visible from every beach in this incredible area, are Powell River’s best kept secret: our sunsets are up there with the best in the world!